A dainty, fabulous and exquisite product, this gorgeous and one of a kind jewelry holder will be the best next gift for your lovely daughter! This beautiful product is made of sturdy and resilient metal so it will prove to be resistant throughout time. Furthermore, it has been covered with a fine and premium layer of pink and superior paint, thus making it the perfect gift for your princess! It is a shiny, bright and lively color! It contains a fancy and lovely design: a mesh square part that is perfect for rings and earrings, three curved hooks for other pairs of earrings, several other holes and upright hooks as well! In addition to that, is has a spacious and roomy tray as well, thus allowing you to keep even more of your precious items together! 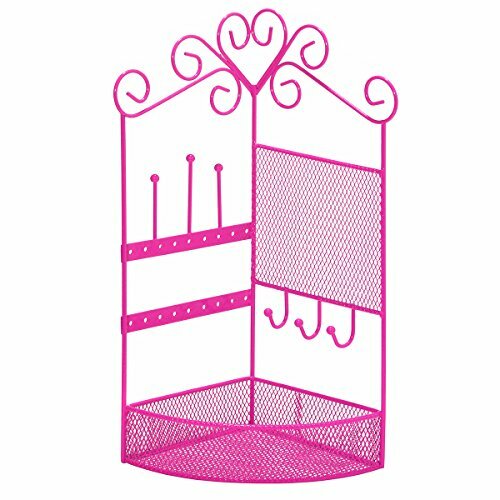 There are adorable and cute heart patterns, making this jewelry holder the best present for any daughter. The product stands 12 inches tall. The tray can easily store a wider range of jewelry and any other trinkets too. This is definitely a unique and stunning product that will surely not go unnoticed by anyone who sees it! Your daughter will fall in love with it at once and your fine taste and love will be surely appreciated by her! Buy this product as soon as possible and see it is definitely worth it. The overall dimensions of the product are the following: 6.5 x 4.5 x 11.8 inches and its weight is 2.4 ounces.